Over on Google+, photographers have gotten together using hashtags to create daily themes. This idea has been around forums and flickr for years. However, on Google+, it has been taken to a whole new level. Eric Leslie is the keeper of the Google+ daily theme lists which currently has over 70 different themes. If you are a photographer, I am sure you could find a theme or two to join. I contribute to about a half dozen each week including #WaterfallWednesday (to create a linkable hashtag on Google+, you put a pound sign (#) in front of words which must not contain spaces. Just like on Twitter). 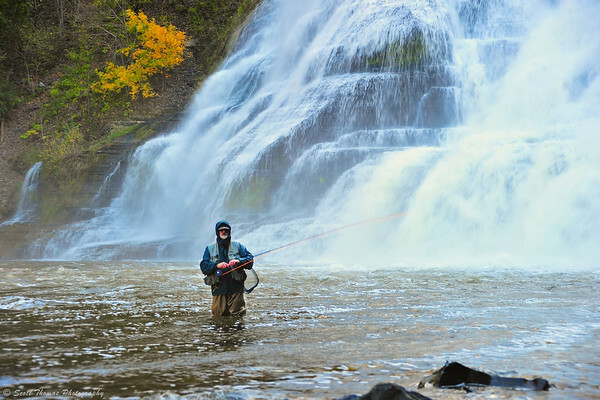 Last week, I shared this photo of a fisherman at the foot of Ithaca Falls for Waterfall Wednesday. A fisherman near Ithaca Falls in Ithaca, New York. Nikon D700/28-300VR, 1/30s, f/5, ISO 200, EV +0.3, 85mm focal length. 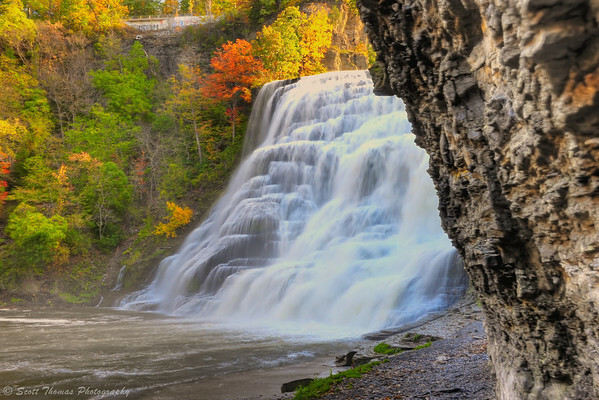 This week, I will be sharing this HDR image of Ithaca Falls. I used a set of five photos spread out over a 5 stop range from -2 to +2. Without this set of photos, the falls would have been properly exposed with the cliff wall in total darkness. Ithaca Falls in Ithaca, New York. Nikon D700/28-300VR, f/16, ISO 200, +0.3, 36mm focal length. 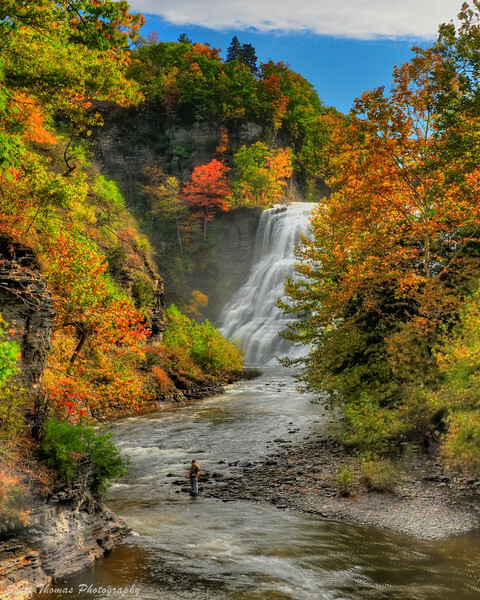 Next week, I think I will complete the Ithaca Falls trilogy with another HDR image combining the falls, Fall Creek and another fisherman on a stunningly beautiful autumn morning. Fall Creek below Ithaca Falls accompanied by a fisherman on a beautiful autumn morning. Nikon D700/28-300VR, f/16, ISO 720, EV 0, 42mm focal length. This entry was posted in Nature and tagged 28-300mm, autumn, fall creek, fall foliage, fisherman, fishing, google, google plus, hdr, ithaca, new york, nikon D700, outdoors, rapids, vr, water, waterfall. Bookmark the permalink. I spent ten minutes over there one day and was so incredibly confused! That was back when it was just getting started though…maybe I just couldn’t envision how it would work. Here I am stepping away from Twitter, and stepping back from FB so I can devote more time to blogging and photography, do I really want to get entrenched over there? Opinion please. That is up to you, KD. Google+ can be a bit overwhelming at first but I am guessing so was FB and Twitter when you first started using them. Colby Brown wrote up a good introduction to using Google+ for Photographers (and for most anyone else) which should help to demystify the G+ world called the Google+: The Survival Guide for a Photographer’s Paradise. While only you can judge if it is a paradise, I sure do enjoy it more than Twitter and FB combined. That is, of course, my own personal opinion. That last waterfall image….WOW!!! Magestically beautiful!!!! Thank you, I really like the last one as it goes beyond the photo into the realm of artwork like a painting. LOL You old fuddy-duddy! See my reply to KD’s comment. As I said, only you can determine if G+ is something you wish to use. Like anything, you’ll get back as much as you put into it. We could all Hangout together there. Shared one of my allready uploaded picture from my Album with the mark #WaterfallWednesday but it does show up there….what else I have to do ? When click on #WaterfallWednesday I do see a way to upload there…. What I am doing wrong ? You did fine, Reinhard! The hashtag is correct and if you click it you’ll see other posts using it. thank you …yes, now i can see my pictures there …. Wow, beautiful! I can almost hear the rushing water. I don’t spend much time on Google+ Not much going on over there anyway. I’ll let Thomas Hawk answer your statement about Google+: Google+ is Soooooooo Not Dead! I absolutely love the last image. It is beautiful beyond words! I’m echoing everyone else here now, but I do love that last image – really spectacular. I haven’t even peeked at Google+, and can’t decide if I want to! I will be making a big print of the last one for sure. Click on the links I have posted in the thread and to my G+ profile (right above the Twitter button in the right column) and check it out. These are great Scott. I particularly like the last one very much. Such color and depth really makes these photos pop. Thank you, Preston! You and Anna are an inspiration to me. After I was done with the bottom photo it reminded me of your works. I am thrilled you like it! The last image is gorgeous.